The Coatham Enclosure was built in the year 1930 at the West end of the town. It was in the open air, and contained gardens, lawns, with wooden seating around a boating lake. The enclosure/boating lake itself was very popular, and had an island in the centre accessed by a stone bridge. The steps up to the bridge were illuminated with electric lighting. On the island was another wooden Edwardian circular shelter, complete with seating, and a tiled roof. These structures matched the entrance shelters, and those along the sea front. The boating lake shelter was eventually taken away, and a fountain replaced it. An open air swimming pool was situated nearby. 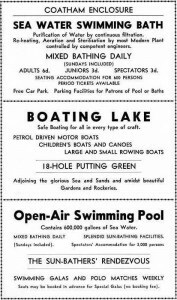 Over the years the area has become neglected, with the boating lake becoming unused and the swimming baths removed, but the area is now subject of possible re-development. 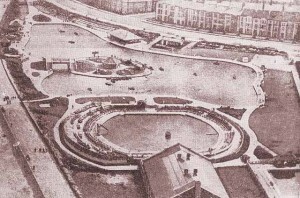 During the year 2009, the boating lake of the enclosure was completed renovated with the lake being emptied of everything. the Victorian Bridge taken down and rebuilt. The lake itself was re-filled with water and rocks to create a wild bird habitat, complete with grass land, shrubs and bushes. It is hoped that once the shrubs and bushes grove it will be ideal to walk and sit in the peace and quiet, or even have picnics.